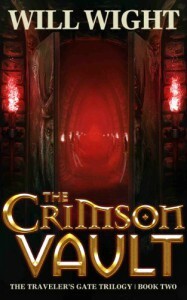 The second installment of The Traveler’s Gate Trilogy opens several weeks after the events in House of Blades. In the beginning, I felt as if I had missed the first 45 minutes of a film. I thought “who are some of these people?” and “what in the heck is going on now?” I admit, that could be because about halfway through the first book, my interest waned a bit. There is a nice bit of info that was missing from book one, but this book starts out with the same stilted dialogue and it’s almost as if the author is trying too hard to make up for lost time. There are too many magics, too many creatures, too many places, etc., all stuffed into the first half of this book. "We are the Gar'rosh" the orange lizard-man said. In Naraka, we punish murderers." There are so many creatures the author runs out of names for them. "Something huge roared, and-- though Alin didn't turn around-- he would have bet it had a mouth full of razor-sharp teeth. The whole floor thundered as the whatever-it-was pounded down the hallway toward its prey." I think Will Wight has included every idea he’s ever had for a fantasy book here. At times, throughout the book, it seems as if he’s throwing stuff in randomly, out of nowhere. I did really like that the prologue in book two gave us the same prologue as book one, but from another person’s point of view. That person just happened to be Indirial, the mysterious stranger who rescued Simon and his mother. I say, about time we got to meet Indirial! At Valinhall, Simon is recuperating from injuries taken in battle. Tired of the politics of Enosh, he’s quite happy to be back even though everything at Valinhall tries to kill him. With his new advisors, Kai’s dolls, he is working on conquering more of the challenges that the house has to offer, so that he can acquire more powers. Alin, Elysian Traveler and prophesied hero, has taken up residence in the Grandmasters’ Palace in Enosh. He is being hailed as a hero in Enosh for killing Overlord Malachi. He knows that Simon had a lot to do with that and he wants him by his side, even though the Grandmasters don’t like him. The Grandmasters are planning a war against Damasca, where they want to destroy the Trees that seal the Incarnations. THAT'S RIGHT, FINALLY........about 80 pages into this book, Grandmaster Naraka explains to Alin what the Hanging Tree and the sacrifices were all about in the first book. "Anyway, we learned that Damasca had sealed a very powerful force at the center of the Latari Forest. It is to maintain this seal that the Damascans sacrifice nine lives every year." Leah has returned to the Damascan royal palace in Cana, where she is a potential successor to the throne, along with her other siblings. Her siblings are conniving to kill her father and take his place. Leah’s father has assigned her to keep an eye on Alin, and to gather information on the Grandmasters’ war plans. Leah has also decided to keep an eye on Simon and do everything she can to stop her brother Talos’s ascension to the throne. When one of the Hanging Trees dies and the Valin Incarnation escapes, Leah’s father, King Zakareth of Damasca sends his Overlord, Indirial to kill it. While the Incarnation is slaughtering hundreds in its path, the Grandmasters are trying to catch up with it to acquire its aid in their attack on Damasca. LET THE BATTLES BEGIN!!! Alin is fighting for Enosh, Leah is the heiress in Damasca and Simon is trying to stay neutral. It's really not clear which side I'm on.